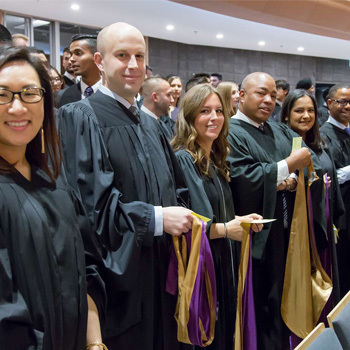 On Oct. 28, 2017 we celebrated the accomplishments of our Lazaridis Executive Master’s in Technology Management (EMTM) 2016/17 graduating class. We welcome our newest Laurier EMTM alumni to an elite class of technology executives across Canada. Our graduates are sparking innovative organizational and product design change in their companies and are doing so with the support and mentorship of fellow learners and instructors from our program. We wish our graduates all the success as they move forward in their careers with new knowledge and confidence, and welcome them to the masterful community that is our EMTM alumni group. For information on joining this elite group, we invite you to review the EMTM admission requirements.